BALASHIKHA, December 22. /TASS/. The 2018 year budget of the Russian Defense Ministry will total $46 bln, Minister Sergei Shoigu said on Friday. "2.8% of GDP or $46 bln," the minister said. The Pentagon’s budget for the next year will be over $700 bln, Shoigu noted for comparison. The budget of the United Kingdom’s Ministry of Defense will be about $60 bln and the budget of defense agencies of France and Germany will be $40 bln each. "No comments are needed," the Russian minister said. "The Russian army at present is modern, mobile, compact, and battle-worthy. However, we do not flex muscles and do not intend to fight with anyone. At the same time, we do not advise anyone to test the strength of our defensive ability," Shoigu said. Russia’s Defense Ministry plans to increase modern combat hardware’s share in troops to 61% in 2018, he said. Putin said "it [the level of defense expenditures] will be 2.85-2.86% of GDP in the next year and it will be reduced further later on. The question arises: can we be self-sufficient in such conditions and with such capabilities, can we reliably and unconditionally support defense capability of our state? We can, we must, and we will do that." "The share of state-of-the-art equipment has grown four-fold since 2012, the pace of the development of the Armed Forces has increased by 15 times," Shoigu said. "In 2018, the Defense Ministry plans to increase the share of modern combat hardware in the Armed Forces to 61%," Shoigu said. According to the defense minister, modern combat hardware is expected to reach 82% in Russia’s strategic nuclear forces, 46% in the land troops, 74% in the Aerospace Force and 55% in the Navy. "Three modernized planes came into service with the air-based strategic nuclear forces," he said. Six snap checks carried out this year have confirmed the Russian army’s combat readiness, he went on. "Troops’ real capabilities to accomplish missions have been confirmed during six snap combat readiness checks this year. They involved all military districts, types and branches of the Armed Forces, as well as Russia’s federal and regional government agencies," Shoigu said. According to the minister, snap checks are the main form of inspections and troops’ combat training. 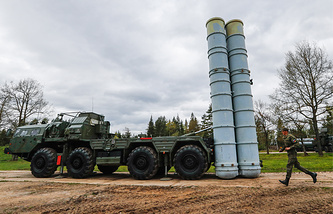 The Russian Aerospace Force will receive 10 division sets of S-400 Triumf air defense systems in 2018, he said. "To deliver 203 new modernized aircraft and helicopters, four Zenit division sets for Pantsir air defense missile and artillery systems and 10 division sets of S-400 Triumf air defense systems to the Aerospace Force and the Navy aviation the next year. To secure implementation of training combat duty tasks of the Unified Space System [EKS]," Shoigu said. It is necessary to deliver 35 ships and logistics vessels to the Navy in 2018, Shoigu said. In addition, there are plans to make 11 launching platforms for Yars ballistic missiles operational within the Russian Strategic Missile Force the next year, the Russian defense minister specified. Russia’s Pantsyr-S missile and gun systems deployed to the Hmeymin airbase destroyed 16 unmanned aerial vehicles and 53 multiple rocket launcher munitions, he said. "The Pantsyr-S systems, which have been made capable of intercepting rockets and hitting other small targets, destroyed 16 unmanned aerial vehicles and 53 multiple rocket launcher munitions," he said. The number of NATO forces deployed close to Russia’s borders has grown from 10,000 to 40,000 troops, he went on. "The number of NATO’s contingents deployed to Russia’s western borders has grown three-fold since 2012. Four battalion tactical groups have been deployed to the Baltic region and Poland, an armored brigade of the US Army, the headquarters of NATO’s multinational divisions have been deployed to Poland and Romania. The number of the alliance’s forces has grown from 10,000 to 40,000 troops," he said. Shoigu added that "the US missile defense system in Europe has been placed on a standby alert". Its elements have also been deployed to Japan and South Korea. "We thwart any attempts to violate Russia’s airspace and maritime borders," he stressed. Russia expands aircraft patrol area and ship cruises due to NATO activity, he added. "NATO has doubled the intensity of its military drills along our borders: in 2014, the Alliance conducted just 282 drills, and this year, as many as 548. More than 30 drills are annually carried out along Russia’s western borders, the scenario of which is based on armed confrontation from our side. We are closely monitoring each NATO drill and take correspondent measures. We expanded the Long-Range Aviation patrol area and ship cruises for responding to threats and supporting the strategic balance," he said. The strategic rocket aircraft carried out 178 combat flights in just five years, and "ships of the maritime fleet carried out 672 cruises to all strategically important parts of the World Ocean," he said. The Russian defense minister earlier reported that the number of NATO forces along the Russian borders has grown from 10,000 to 40,000 people since 2012. In the past five years, the Russian Defense Ministry received 80 intercontinental ballistic missiles, 102 ballistic missiles for submarines and three Borei-class ballistic missile submarines, he said. "In the past five years, the Armed Forces received 80 intercontinental ballistic missiles, 102 ballistic missiles for submarines, three Borei-class ballistic missile submarines, 55 space vehicles, 3,237 tanks and other armored fighting vehicles, as well as over 1,000 aircraft and helicopters, 150 vessels, six submarines and 12 Bal and Bastion coastal missile complexes," Shoigu said. "The Strategic Missile Forces will put into operation 11 launchers of Yars mobile missile systems. 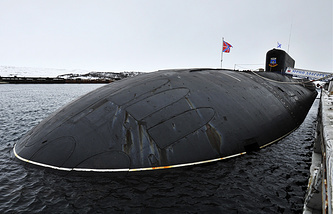 The first Project 955A Knyaz Vladimir nuclear submarine, armed with Bulava ballistic missiles, will join the Navy," he said. "In conformity with your instruction, we will ensure permanent presence of Russian warships and submarines equipped with long-range high precision weapons in the Mediterranean," he said at Putin’s meeting with the defense ministry’s top officials and commanders of troops in military districts and the Northern Fleet. "Your order to withdraw the Russian taskforce from Syria has been implemented," Shoigu told Putin. "Aviation units, specialists from the International Mine Action Center, military doctors, a medical unit, the military police battalion and officers of the special operations forces have returned to Russia," Shoigu said. According to the minister, thirty-six warplanes and four helicopters, as well as six Tu-22 bombers have returned to their home bases. As many as 157 motor vehicles have been taken to Russia by sea-going transport. "Long-range high-precisions missiles Kalibr, X-101, Iskander, Tochka-U, X-55 and others, were used against major terrorists’ targets," he said. According to the Russian defense minister, a total of 100 strikes were delivered from warships and submarines, 66 strikes - by strategic warplanes. "Each missile hit its designated target," he said, adding that servicemen of the special operations forces had been active far behind terrorists’ lines to coordinate air and artillery strikes. "More than 48,000 Russian military servicemen have gained invaluable experience in Syria. Of these, over 14,000 were decorated with state awards," Shoigu said. "There wasn’t any fact of violations of security zones of Russian bases in Tartus and Hmeymim," Shoigu said. The defense minister said Russia’s air group at the Hmeymim base and the Tartus naval facility are operating at full capacity. "In accordance with your decision, the Russian center for reconciliation of the conflicting parties and three military police battalions that are controlling the de-escalation zones continue to operate in full staff in Syria to support political settlement and a return to peaceful life," he said. "Two our bases will also remain on a permanent basis in accordance with international agreements: the aviation group at the Hmeymim airport and the logistics support group in Tartus," Shoigu added. The minister gave the head of state documents on the structure and military staff of the units postured in Tartus and Hmeymim and asked him to approve them. "Modern military and social infrastructure has been created there, this allows maintaining strategic stability in the region and preventing possible incursions of terror groups in Syria," he said. "During the Syrian operation, most kinds of our military equipment were tested, including 215 kinds of weapons. As many as 702 faults were identified during military activities, 99% of which have already been corrected," he said. "We are grateful to people from our defense industry for their promptness," the Russian defense minister noted. 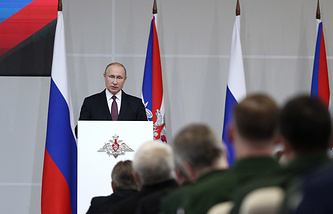 "During the operation in Syria, as many as 60,318 militants, 819 militant group leaders and 2,840 militants coming from Russia were eliminated," he said at a defense ministry board meeting that was attended by President Vladimir Putin. Apart from that, according to Shoigu, as many as 8,000 terrorists’ armored vehicles and cars equipped to large-caliber machineguns, 718 weapons and munitions plants and workshops were destroyed. Russia’s air force stopped and eliminated illegal sources of militants’ incomes from sales of oil that amounted to at least three million US dollars a day. "A total of 396 illegal oil production sites, refineries and 4,100 fuel trucks were destroyed," the minister said. "The Russian center for reconciliation of the conflicting parties and three military police battalions that are controlling the de-escalation zones in accordance with your decision continue to operate in full complement in Syria to support political settlement and a return to peaceful life," he said at a meeting with Putin. Russia’s Defense Ministry has deployed over 1,000 troops on Arctic islands, he said. "Over 1,000 servicemen have been deployed on the Kotelny and Wrangle Islands and Cape Schmidt," the defense minister said.